I have a happy news to share with you!!! 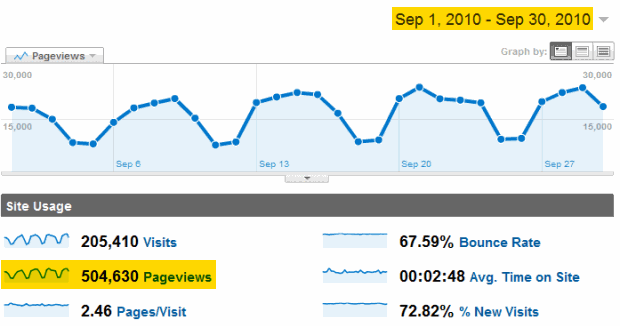 For the first time since starting this website, we got 500,000 + page views in the month of September 2010. Half-a-million! To put this in context, in Sept 2009, we got 245,000 views. Traffic grew by more than 100% in last 12 months. And the 340 students who signed up for excel school 3rd batch put a cherry on top with strong revenues. I just want to take a minute and say how much I am thankful to you. Each day, you inspire me to learn new things about Excel. Your quest for knowledge keeps me motivated. I am fortunate to have found you, my dear reader, to share what I know and learn from you thru comments, emails, forum discussions, phone calls and tweets. Of course, I wouldn’t want a Friday to be wasted in silly navel gazing at website stats. So, I have 2 excel tips for you. 1. How to show numbers in millions? Simple. Select the cell(s) with numbers in them. Now, from number tab, select custom. Use the format code ,,0.0 ” mn” to show values in millions. For eg. 1,500,000 would show up as 1.5 mn. 2. How to show values in millions in charts? Set the option “display values as” to Millions and you are done! More quick tips & custom cell formatting tips. Thank you once again. You have a beautiful weekend. Is this a new abbreviation for million, "mn" versus "mm"? We still use "m" for thousands. Can you do a whole post on custom number formats? It seems to be really useful, but I'm finding it really difficult. Congrats Chandoo. 500,000+ page views is bigg and over 100% growth rate is even bigger (on a larger base). Keep it up! congratulations to your success, well done! version / with every country settings. Mine 100'000.00 will be shown as 100000.0,, mm with 0.0,, "mm". How can I bring it to work? Mike, try the the same symbol you are using for thousand separator. Congratulations and thanks a lot for creating such a awesome site!!! Wish you much more success Chandoo.. Thanks a million for this awesome tips/tricks..I have learn so much..
Hey there! I've been following your web site for a while now and finally got the courage to go ahead and give you a shout out from Houston Texas! Just wanted to say keep up the fantastic job!